Our area was called The Uplands by early settlers - it was one of the first to emerge from the glacial Champlain Sea, which results in a number of unique plant communities in the area, notably at the Leitrim wetland. As late as Col.By's surveys for the Rideau Canal, it was still heavily forested. No evidence has been found of any human presence prior to European settlement. The Rideau River then was a series of sloughs infested with malaria (Plasmodium vivax, not the more lethal African P.falciparum) most of the year before Col.By began work, and was rarely used by indigenous peoples. By's surveys had to be done in the winter because the route was close to impassable during summer. Part of the Crawford Purchase of 1783, it was officially designated as the Township of Glocester (pronounced 'Gloster', and then spelled without a 'u') in 1793. It became part of the Ottawa District (judicial) and of Carleton County (political) in 1816. Initially, the whole township was granted to a Colonel Wm.Fraser. Soon, as elsewhere in Canada, this massive grant was rescinded and a more equitable grant system implemented. 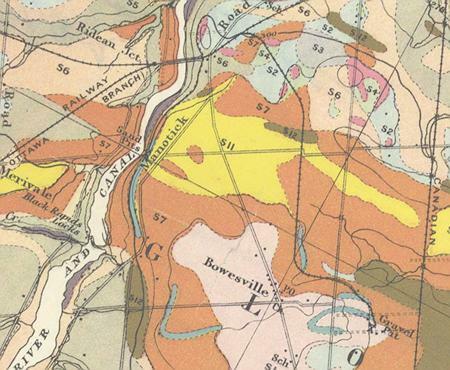 Here is the earliest map I've found that shows any detail of our area. Published in 1838 by the Surveyor General, it's in fact at least a decade older. 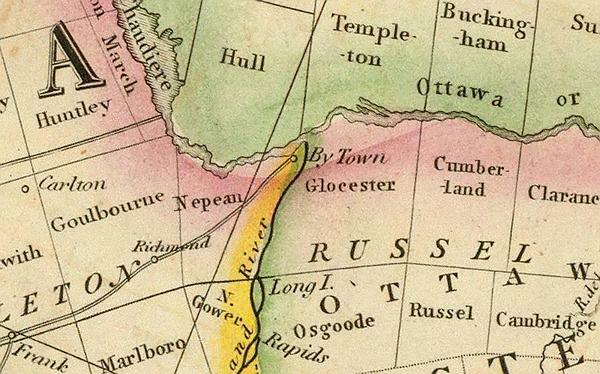 The only road shown from Bytown is the 1818 Richmond Road to Perth, but an 1833 map of Upper Canada published by New York State shows today's highway 17 from the west border of Carleton County through Bytown to the Quebec border and today's Prince of Wales Drive from Bytown through North Gower (pronounced 'Gore'; British pronunciations of the time frequently skip syllables) to Lower Rideau Lake. The first real resident of our area was Captain Andrew Wilson. He built a log house just north of where the Rivergate condos are today, and named it Ossian Hall after a mythical Celt who was seduced by a golden-haired fairy and lived 300 years as a result. The original Riverside Drive was a trail to his front door and he, wife and servants welcomed all who arrived there by land or river. One of the first group of magistrates appointed by Bytown (now Ottawa) in 1828, he held court in full Royal Navy uniform, doubtless with salty language to match the rowdies who appeared before him. He boasted one of the finest book collections in the area, and his evenings at Mother Firth's tavern were legendary. One Daniel O'Connor and wife Margaret stayed at Ossian Hall in 1827, and she loved it. Wilson encountered financial difficulties in 1829 and fled to Lower Canada (now Quebec, a separate country then). Margaret, with family money, bought Ossian Hall and its associated land. Daniel began as a shopkeeper in Waterford Ireland, enlisted as a mercenary for the war of liberation in Venezuela but never got there, briefly settled down again as a married storekeeper in Ireland, then sought his fortunes in North America with wife and daughter. Ending up in Kingston and disliking even it, he headed for home via the Rideau Waterway. Col.By, his countryman Nicholas Sparks, and his wife encouraged him to stay in Bytown and he did. He became Bytown's first town clerk in 1828, was soon appointed a magistrate, and was almost the only Catholic accepted in the local establishment of the time. During the peak of the Irish riots of the 1830's, Nicholas Sparks, an Irish Protestant, named a street after O'Connor that formed a Christian cross with the street of his own name in the center of the most troubled area. They are still named that today. Daniel died in 1858, Margaret in 1872. The Putnam map of 1863 below shows Ossian Hall (just to the left of the road by the T.H.) and another building across the road. J.C.&H.Castle were tenants; land registries show that it was owned by O'Connors throughout this time. The map also shows that McCarthy Road was established by this time. In 1854 the Bytown and Prescott Railway was completed along our eastern border as shown above; renamed Ottawa and Prescott in 1855, it was leased to the CPR in 1881. It's now owned by the City of Ottawa and used for the O-Train. A Historical Atlas of Carleton County, H.Belden &Co. 1879 shows that two of the O'Connors' sons owned 300 acres here. It also shows Hunt Club Road between McCarthy and the River Road. According to Gloucester tax rolls, no O'Connor was resident at Ossian Hall over 1860-1879, so his legatees were absentee landlords. Daniel & Margaret probably treated it as a summer cottage; they always had a primary residence on Wellington Street. Donald McCarty was granted his first land in 1854; his name is spelled both with and without an h at the time. He, together with his father William and older brother John, held a total of 225 acres in Gloucester by 1860. The maps show he held 150 acres in our area by 1863, and retained 50 as of 1879. The family name was given to McCarthy Road, and hence to the McCarthy Woods, in the 1950's. The Hackett and Gillespie names also still survive as local street names. Today's Hunt Club Road is outlined in red above; the Southern Corridor in green. William Upton, a British engineer, thought he had a secure future following his father in designing Russian military facilities in the 1800's. He was made a colonel in the Russian army and granted an estate near Sevastopol. Unfortunately for him, the Crimean war unexpectedly pitted England (defending Turkey) against Russia in 1854. He had to watch the disastrous British Charge of the Light Brigade as a prisoner while the defences he had designed worked all too well. His estate and career were destroyed. Finding himself unwelcome in England, he, wife Charlotte and five children set sail for Canada in 1857, and moved to the corner of Bowesville and Hunt Club roads in 1859 - his home appears just under his name. With four attractive daughters, his vivid stories of exotic lands and battles, his command of 7 languages and his wife's skills as hostess, his home was a social center for our area for the rest of his life. His son sold a southern part of the farm that is now the Ottawa Airport in 1902, then sold the rest in 1907 to the Ottawa Hunt Ltd., now the Hunt Club Golf & Country Club. Part of the branch line roadbed was re-used during the 2nd war to supply an RCAF training school. The roadbed and ties from that period are still visible in a few places in the corridor. Here is our area as shown on sheet 31G/5 5th edition of the Geological Survey of Canada. The road leading west from Bank Street (the 31) went over a level crossing to the Plante Dairy which operated from 1926-1975; the stone bluffs at McCarthy Road still appear to be natural. 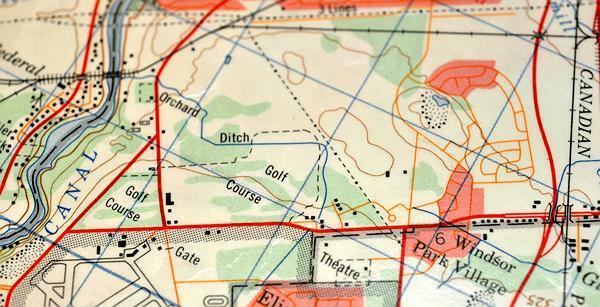 Canadian topographic maps were issued first by the Department of Militia & Defence, then by the Department of the Interior, and were labelled solely by the publication and revision history. When the Geological Survey took them over after the 2nd war, they were reissued as "editions", initially with minimal changes. This map is labelled as being based on a manual survey of 1910, a partial resurvey in 1923, and a variety of site revisions as late as 1948. The rail line across our area shows the 2nd war route to the RCAF school, as do all surviving "2nd editions" I have found. From 13,000 years ago to about 10,000, our area was covered by water, the Champlain Sea. A relic of this time was found in 1924 in the sand pits just north of today's Shefflin Bridge, a scapula and four vertebrae of a White Whale (Delphinapterus leucas). Another was found in 1948, an almost complete skeleton of the same species. Both finds are now in the Canadian Museum of Nature downtown. The Southern Corridor began its existence under that name in 1950, with the publication of a Plan for the National Capital by Jacques Gréber. Prepared at the request of Prime Minister Mackenzie King, the plan served as the template for the national capital for the next two generations. One of Gréber's recommendations was for a ring road around the capital (in red below on his master plan), with the land outside it reserved as a rural green belt to limit urban sprawl. 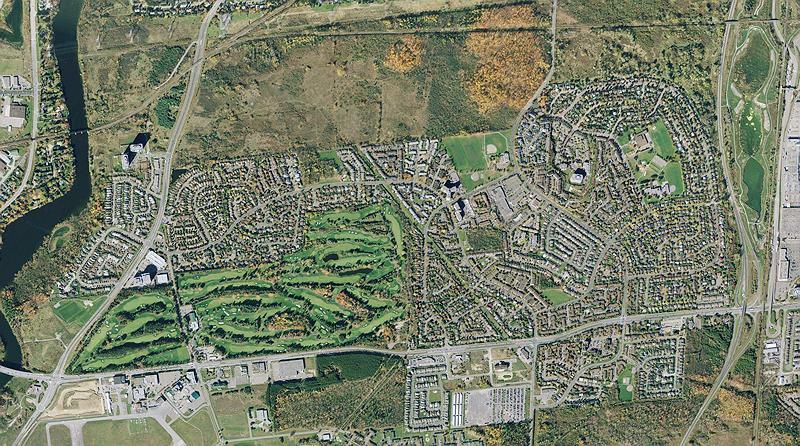 The Federal District Commission promptly began to buy land for both, and the City of Ottawa equally promptly annexed the area to implement it. In the area now known as Hunt Club Woods, the land the FDC bought for the Southern Corridor (in green above) was a bit to the north of Gréber's recommendation. The land was then owned by Margaret and Kenneth Dowler, whose ancestors had bought it from the estate of Dr. O'Connor about 1883. Ossian Hall seems to have been replaced by a two-story brick building about 1920; its address was 3596 Old Riverside Drive when it in turn was demolished shortly after 1998 as part of the re-alignment of Riverside Drive. Another Gréber recommendation was that railways be eliminated from the center of the city, to reduce both the noise and pollution of coal-burning steam locomotives and the dozens of level crossings of various railways throughout the city. 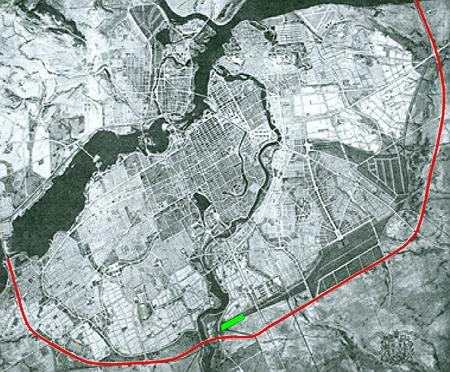 Ottawa Central Railway built the Walkley Line that forms our northern border in 1953, naming the west end Wass Junction after the FDC engineer who negotiated it, and diverted freight trains along it to implement that recommendation. The line is now owned by CN and carries only a weekly train to Arnprior. 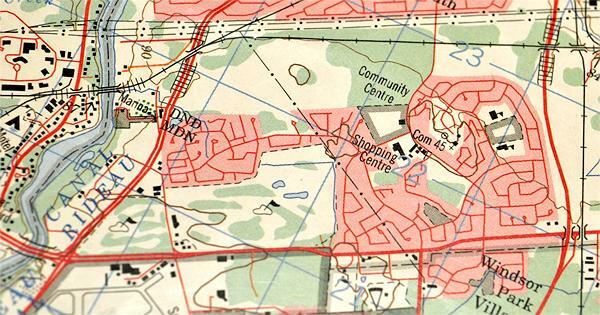 The 6th edition, above, was the first to be based on the new technology of stereo aerial photos using the Analytical Plotter developed at the NRC Montreal Road laboratories; they were taken in 1955. The stone quarry east of McCarthy road that provided aggregate for the building of the Queensway is shown for the first time as an indentation in the bluff. The extent of the sand quarry used by businesses along the Rideau Waterway and by the CNR is clear. 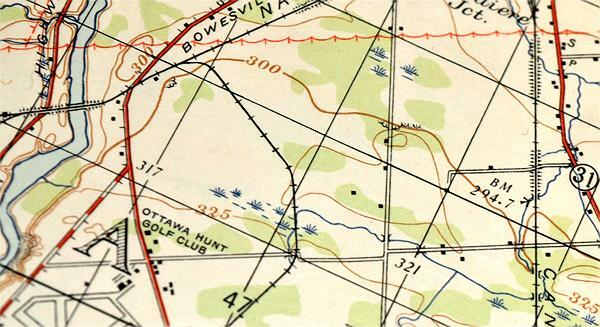 Hunt Club Creek appears for the first time on a map; it includes the ca.1950 DND cut through the limestone ridge at the north-east corner of the golf course land, but not the extension south of Hunt Club Road. 7th ed., photos 1967. 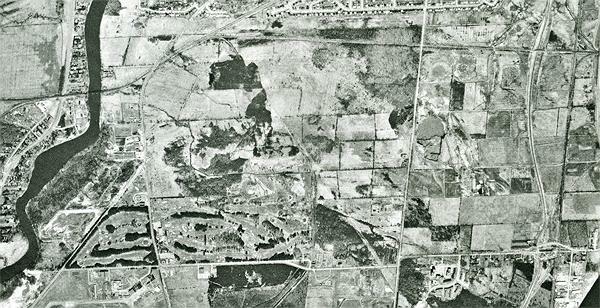 The quarry east of McCarthy Road is now larger; the railway across our area is gone; Hunt Club creek has been moved from the east side of the River Road to the west side and its extension to the air base is shown. Over the years, various proposals have been made to develop the Southern Corridor, but in the area of Hunt Club Woods, it has sat idle since its acquisition in 1953, except for occasional rentals to farmers to harvest field crops and mowing of patches by the National Capital Commission. Here is an aerial photo of 1973. 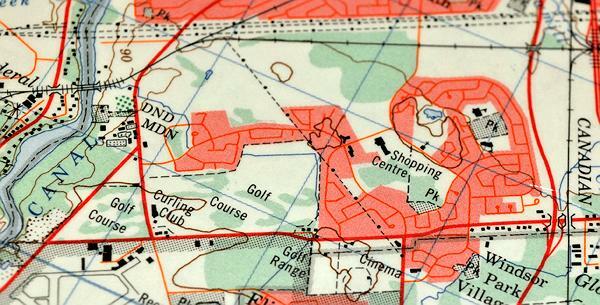 The 2nd war railway spur to Uplands is still visible; the bridges over Hunt Club Road for the Airport Parkway and railway are under construction; Fine's Flowers and the sand quarry dominate the area west of the River Road. 8th ed., photos 1975. The east part of modern Hunt Club is taking shape. Called the Western Community (west of Bank Street) by planners, it was envisaged as a pure bedroom community for all ages and socio-economic groups - zero employment or shopping anywhere except by car. Hunt Club Woods is still vacant. The old McCarthy Road still exists as a stub; Bowesville road is blocked by the airport; the airport parkway has just been completed. A pond has appeared in the McCarthy Road quarry. 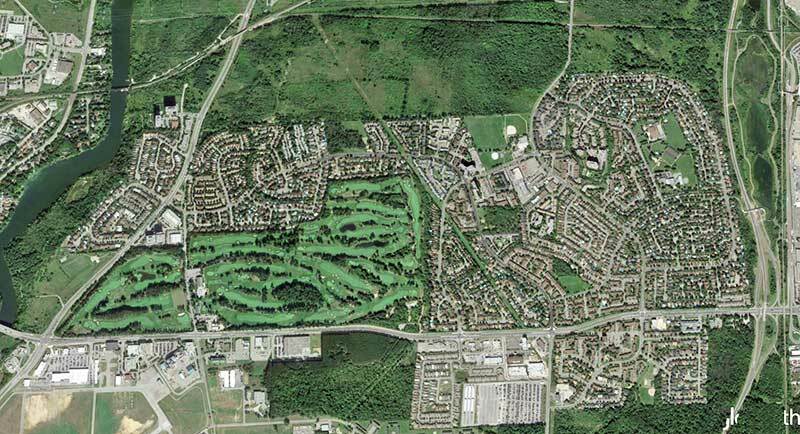 Hunt Club Creek is not shown as ditched along the eastern edge of the golf club, although that was done prior to 1973, as the air photo above shows. 9th ed., photos 1979. The pond in the sand quarry next to the Rideau River, used as a swimming hole for some years, is visible; Hunt Club Woods is not yet complete; all the riverfront homes south of the rail bridge have been expropriated and destroyed. 11th ed., photos 1994, the last printed edition of the map. Riverside Drive has been rerouted through an underpass of the CN line; the Sheflin bridge has been built, as have the Chateaus of Hunt Club and Chatsworth Crescent; Hackett stormwater pond is present. Canada's maps are now based on an American dataset mostly compiled in the 1950s at the height of the cold war. Without the discipline of printed editions, updates to them are sporadic, theme-centered, and mostly undated. The 31G/5 CanVec map as of March 2013 is over a decade out of date in most aspects, 5 decades in the case of watercourses and land forms; only roads are updated most years to meet the needs for vehicle GPS navigation. Satellite and air photos are the only reliable sources now. Here is an air photo from 1999. Quinterra is now almost complete, as is Rhapsody Lane; Annapolis Circle is under construction. Google's view 30 September 2008. Riverside-Uplands Park, the Rivergate condos and Hunt Club Chase are now complete; the Sawmill Creek constructed wetland complex is in the final stages of construction; the site of the T&T Plaza is being cleared. Google's view 9 May 2016. The T&T Plaza is complete, the taxiway leading to it has been removed. Hariette Fried, reference archivist of the City of Ottawa, provided me access to the original land registry documents and tax roles of our area; some details are from Rhoda Bellamy's study of the cultural heritage of the area; Glenn Clark of the Gloucester Historical Society assisted the research. I thank David Hutchinson for alerting me to the whale bones found in the sand pits; they are described in the National Museum of Canada Bulletin 121(1951). A transcript of Daniel O'Connor's papers is at the National Archives. The University of Ottawa holds post-WW2 editions of Canada's topographic maps, earlier ones are held by the National Library of Canada. A copy of Gréber's report is in the Ottawa room of the Laurier Street branch of the Ottawa Library. Early air photos of the city of Ottawa are online at maps.ottawa.ca, others are available from the National Air Photo Library. 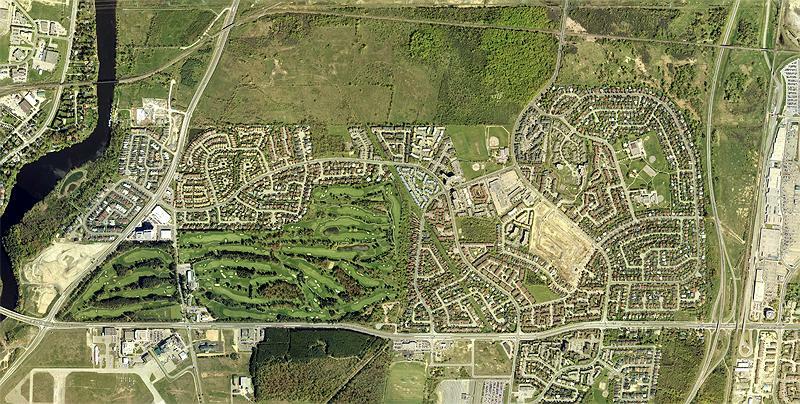 Google Earth keeps satellite images from 2004 on.